We are pleased to announce the appointment of Martyn Whell as the new reserve team boss following the decision by Fish and Leafy to bow out having achieved a reserve cup-double last season. Whelly brings with him a wealth of experience in North Berks football having spent many years at Harwell International as skipper, chairman and assistant manager. As well as his vast experience, Martyn has many good contacts within the game which we hope will stand us in good stead and see the standard of competition for places in both sides rise as a result of his arrival. We are delighted to have him on board and all at the club wish him well in the job and hope this is the start of a long and successful association with the club. JPL U16: Finished 4th out of 18 teams (Played 8 games in total (which was the max number of games played by any team)). The last time these two sides met in competitive league action it was a Hellenic Premier League fixture in the 2007/08 season, a game that resulted in a 2-1 victory for AFC Wallingford as the club was then called. Today, Abingdon Town were playing in the North Berks League for the first time in 75 years and they got off to a flying start courtesy of a fortuitously awarded penalty kick given for handball after the ball had been driven through a crowd of players by Richard Morgan. 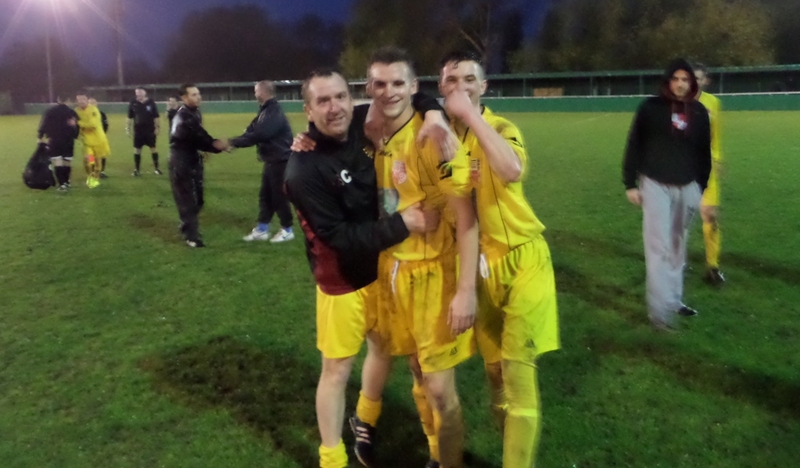 Rob Cattell stroked the ball into the bottom right hand corner of the net to open the scoring on three minutes. In what proved to be an entertaining rather than enthralling evenly balanced contest, Wallingford were always in the game, coming close to equalising on nine minutes when Ashley Searle had the ball slipped in to him as he ran into the right side of the box, but he blasted his shot across the face of the goal. Wallingford came close again on the quarter-hour mark following a well worked free-kick routine that saw the ball played out to Simon Bennett on the right flank. Bennett crossed into the heart of the Abingdon box where Tom Baptie headed downwards and goalwards only to see Ashley Brown do well to gather the ball. There was little else in the way of goalmouth action for much of the rest of the half, but Wallingford found a way back when they were awarded a penalty of their own on 41 minutes for a foul on an attacker as the ball came into the box from a free-kick. Ashley Searle slid the ball into the bottom left hand corner to level the scores, and that really should have been it for the half. However, Abingdon had one last chance before the half time whistle. Cattell delivered a low cross from the right that was deflected by a defender away from the keeper and into the path of the onrushing Tomas Parker who slotted the ball home from six yards out to regain the lead for The Abbots. Wallingford were level again three minutes into the second half when Pete Vallance picked up the ball 30 yards from goal and stormed forward before unleashing a powerful drive from just outside the area that Brown got fingers to but couldn’t prevent from reaching the back of the net. The game got a little scrappy for the next 15 minutes or so peppered with stoppages and injuries, on one such occasion giving all those in attendance the opportunity to marvel at the sight of a Vulcan Bomber cruising over the ground at low altitude. Chances fell to both sides as the game progressed. Abingdon substitute John Mills flashed a shot across the face of goal on 64 minutes, and a minute later Vallance delivered a ball from the right that Bennett headed just wide for Wallingford. Then on 73 minutes Ashley Brown produced a fine blocking save from an Ashley Searle drive, and from the subsequent follow-up play, Abingdon regained the lead. Gavin Jones chipped the ball over the Wallingford defence to Mills standing in the box. Mills trapped the ball well before lifting it over the advancing James Gesner to score. Wallingford were visibly tiring and Abingdon could have added more goals, particularly in the 84th minute when Mills failed to head into an empty net inches from goal. However, deep into injury time Mills redeemed himself with a strong surge into the box culminating in a powerful drive that a defender could only help into the net to give the home side a winning return to the North Berks League. After a strong showing against Saxton Rovers last week the boys are buzzing and eagerly awaiting the visit of Faringdon Town this week. A number of changes have been forced on the side with Tom Baptie, Simon Rees and Stuart Walker all away while Craig Passey and Ishmael Thomas are both injury doubts having sustained ankle injuries against Saxton. Bryn Ingram, a Hellenic Div 1 East winner with Milton Utd last season has signed this week from Didcot Town and goes straight into the squad while Pete Vallance, Chris Allum & Nathan Larking are all added. What better way to start off the 4th Annual North Berks League Groundhop Day than with a passionate local derby between two teams looking to re-kindle former glories? And what better way to settle a tightly contested match than with a spectacular overhead kick that had all 215 spectators applauding as one? The match actually got off to a slow start, possibly a combination of the unusual 10.00am kick-off time and the nervousness of the players not used to performing in front of such large numbers. Craig Passey had a half chance on eight minutes when he headed a Connor Mattimore cross across the face of goal, and on the quarter-hour mark it was a case of Gesner versus Gesner as Crowmarsh’s Scott Gesner fired a half-volley from 20 yards out that brought about a fine diving save from Wallingford’s keeper James Gesner. Wallingford came close to breaking the deadlock on 21 minutes when Tom Baptie saw his goal-bound header from Passey’s corner get headed off the line by a defender. Soon after, it was Wallingford’s turn to clear a ball off the line when Daryl Franklin shot from close range only to be denied by a defender’s outstretched leg. Baptie created another chance on 32 minutes by playing the ball in to Chris Allum as he ran into the box, but his shot could only find the side netting. Allum had come on as an early first half substitute and was central to much of Wallingford’s late attacking threat in the latter part of the half. He saw one header go narrowly wide whilst jumping under pressure, and then saw another header rebound back off the right hand upright. Crowmarsh had the last chance of the half when Jack McLaughlin laid the ball into the path of Tim Holton running into the right side of the box, but he fizzed his half-volley across the face of the goal to leave the scoreline blank at half time. The second half started as slowly as the first, but then nine minutes in came the moment that settled the match. Wallingford’s Simon Bennett ran with the ball down the right flank before cleverly picking out Connor Mattimore just outside the left hand side of the box. Mattimore stepped into the penalty area and drove a powerful low shot that a defender blocked, a block which caused the ball to loop up into the air towards Ashley Searle standing 15 yards from goal. Searle turned towards his own goal and executed a perfect scissor kick to send the ball towards the left side of the target. The ball hit the post and for one agonising micro second it looked as if it would not cross the line, but when it did Searle was swamped by his team-mates as they celebrated wildly. Not much else happened for the duration of the rest of the game, save a last-minute low drive from Craig Duncan which was pushed behind by James Gesner to prevent the draw, but if truth be told anything following Searle’s spectacular overhead kick would have been an anti-climax in comparison. It was an excellent way for this first match of the Groundhop Day to be settled and to whet the appetite for what might occur in the remaining three matches. Ashley Searle failed to equal a consecutive scoring record of seven matches on the trot, but Wallingford Town still won 3-1 at Long Wittenham Athletic. Tom Baptie, Craig Passey and Connor Mattimore netted for the visitors, Lewis Monaghan replying. David Murphy may very well get all the media attention for yet another double, but this game was won by a tactical change at half-time that converted an evenly fought contest into a one-sided affair. It was an unseasonably warm and sunny afternoon, but there was a strong breeze running the length of the pitch which Berinsfield had at the backs for the first period, a fact that seemed to dictate a more long-ball approach to the game. It was Wallingford who maybe should have opened the scoring, though, when on three minutes Andy Allum was gifted the ball in the Berinsfield box, but his attempted lob over the keeper never had enough height on it and was easily picked out by Simon Matthews. Soon after, Mark Ingram drilled a 20 yards free-kick under the wall, but straight into the arms of Garry Clarke. Then the ever determined Max Palmer fashioned a couple of chances that were thwarted both times by Clarke. First, Clarke saved one-handed after Palmer latched on to a through ball by David Murphy, and then the keeper stood firm after Palmer surged into the box after running down the left flank. These were all, at best, half chances, and Wallingford were not creating much, either, despite both sides playing good football. Then on 32 minutes Wallingford were awarded a free-kick on the left following a rash challenge by Luke Hammond that earned him a yellow card. Stuart Walker delivered the ball into the heart of the area from where Andy Allum looped a header goalwards, only to see Matthews tip the ball over the bar. Craig Passey sent the corner right into the danger area, Allum fired low, but Matthews blocked. However, the ricochet fell to the feet of Walker and he instinctively fired the ball home from close range. 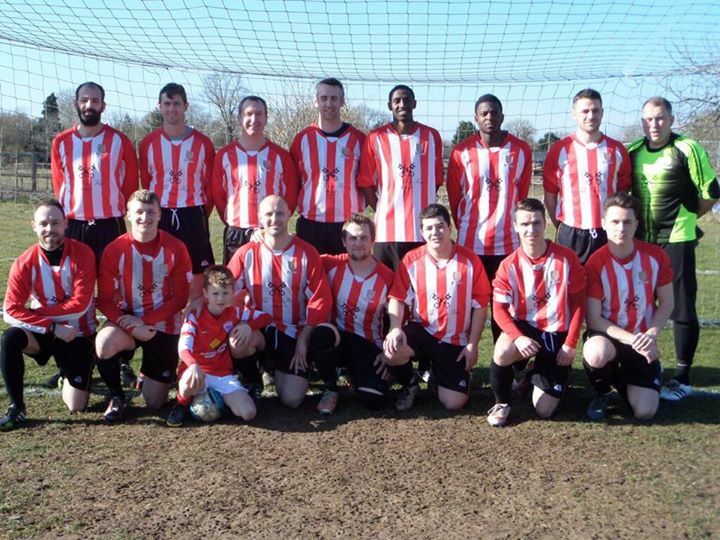 Berinsfield were stung into upping their game. On the 38th minute Mark Ingram played a brilliant through ball for David Murphy to chase into the box from where he fired a low shot on the run that Clarke did really well to save diving to his right. But soon after Berinsfield were level. Murphy delivered a high ball from a corner which Mike Hinkin met with a thumping header as he stormed into the box to equalise with the Wallingford defence looking on. The two sides went in level, a status very reflective of the match so far. Wallingford now had the wind behind them and they almost re-took the lead within two minutes of the re-start. Connor Mattimore sent a corner to the far post from where Andy Allum was unmarked and he planted his header against the crossbar. 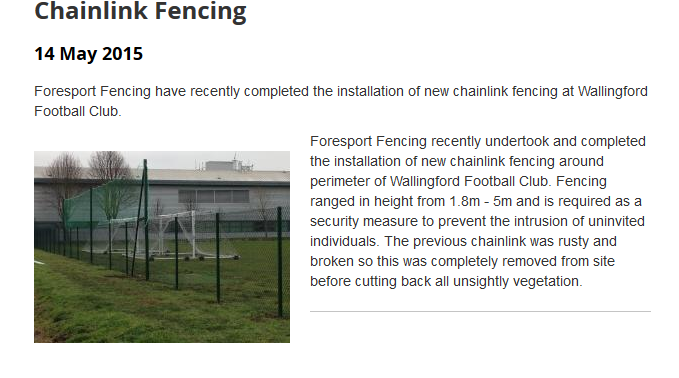 This was to be the last time Wallingford threatened until the game was already won by Berinsfield who now switched from a long-ball game to a short-ball, play-it-out-of-defence approach that resulted in them dominating the second half. On 54 minutes, Max Palmer collected a low through ball and pushed it on as he ran goalwards. Clarke came off his line, but he could only deflect the ball behind him. Palmer sprinted on and as he shot to score he was injured by a chasing defender. Berinsfield had the lead, but their main threat so far was not short from having to be substituted. However, then stepped up David Murphy at the double. First, though, frustration as after he had won the ball on the left flank and surged diagonally into the box, his shot on the run saw Clarke get the merest of touches to deflect the ball onto the bar. However, two minutes later a mirror image spurt into the box on the right side with a similar shot on the run could only be diverted into the net by Clarke to give Berinsfield a 3-1 lead. Then on 70 minutes, from a Wallingford corner, Mark Ingram lofted a ball out of defence for Murphy to chase, and he calmly slotted the ball beyond the reach of Clarke to win the match. In truth Berinsfield should really have scored more that the four goals but for some awful finishing, and Wallingford pulled a late goal back when Mattimore headed home a Liam Reynolds cross. However, by then the game was already won. David Murphy scored twice again for Berinsfield alongside goals for Mike Hinkin and Max Palmer in their 4-2 home win over Wallingford Town for whom Stuart Walker and Connor Mattimore scored. AG Kingham Cup holders, Division Five’s Wallingford Town Reserves, were eliminated from this year’s competition in the Second Round losing 3-1 at home to East Hendred Reserves from Division Two. Connor Bukiej scored their goals, but Dan Sayer, James Hicks and Tom Geach won the match for Hendred. 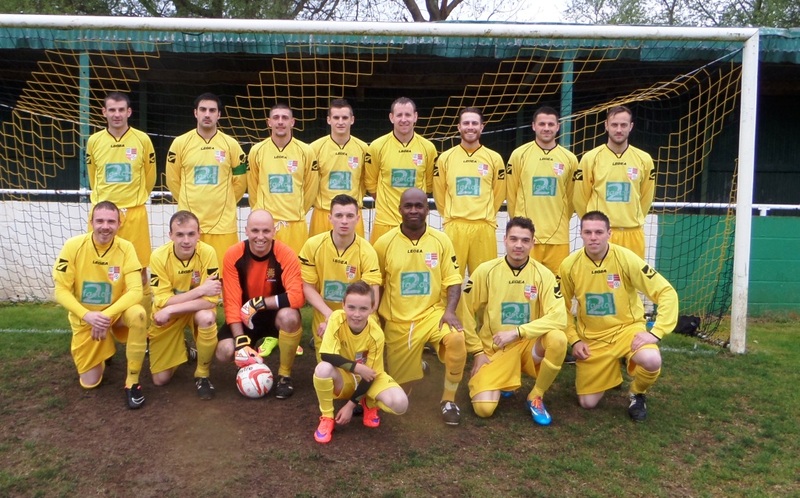 In Division 1, Elliott Westwood was on target to give Wallingford Town a 1-0 win at home to strugglers Watlington Town. 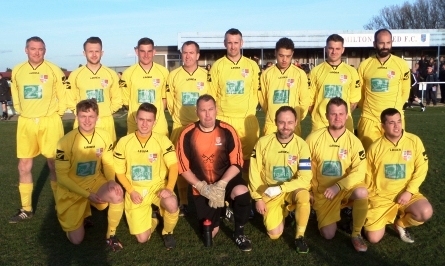 In January 2015 members of Wallingford Town AFC took part in the Cancer Research Dryathlon. 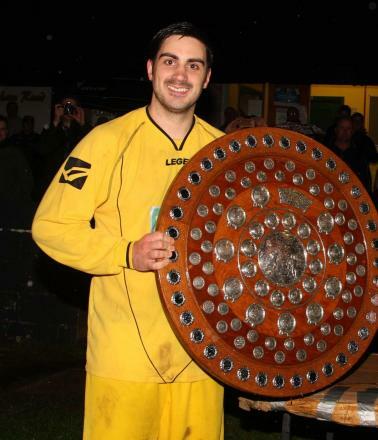 Ashley Searle struck four times, including a late penalty, to see Wallingford Town through to the semi finals of the North Berks League Charity Shield, with a scoreline that probably didn’t reflect the tight contest the match had been for the first three quarters of the contest. On a bitterly cold day with a biting strong wind gusting diagonally across the pitch, it was a credit to both sides that they produced an entertaining cup tie. Wallingford created the first chance on six minutes when Andy Allum hit a speculative shot from 35 yards that had the keeper backpedalling, just managing to tip the ball over the bar. Elliott Westwood deliver the resultant corner to Allum at the far post whose downward header was blocked on the line as was the follow-up by Tom Baptie. Five minutes later Drayton threatened when Andy Chilvers delivered a low corner to the near post from where Carl Bolton flicked the ball goalwards, but safely into the arms of James Gesner. Soon after Ashley Seamark was played through the middle for Drayton and he shot earlier, low from 20 yards on the run, but Gesner did well to get down to save the shot. The ball was soon down the other end when Baptie crossed to Connor Mattimore on the edge of the area. Mattimore chested the ball down before unleashing a low shot that zipped across the face of the goal and just wide. In the 19th minute Mattimore surged down the left flank for Wallingford and delivered a looping cross that seemed to hang over the heart of the Drayton box from where Ashley Searle headed the ball into the goal despite the best efforts of a defender to clear it off the line. Within a minute Seamark pounced on a loose clearance by Gesner at the other end, but saw his shot from the right side of the box cleared off the line by Craig Passey. Wallingford had a couple of clear cut chances to double their lead before the half hour mark. First, Mattimore was played clear through the middle, but his 20 yard lob over the keeper bounced back into play off the crossbar. A minute later Searle was clear through but his low tame shot was blocked by Phil Gregory and the striker could only blast the loose ball over the bar. Drayton started the second half brightly and quickly levelled the scores on 48 minutes. Pat Walsh played the ball down the right flank for Luke Black to chase. Black cut into the box, but his tight angled shot was turned behind by a defender. Andy Chilvers delivered a corner right into the six yard area from where Walsh forced the ball over the line. At this stage the scoreline definitely reflected the balance of play, but from here on in Wallingford moved into the ascendency. The first sign came on the hour mark when Mattimore was played clean through from the half way line. He beat Gregory to the ball but was forced wide and his shot from a tight angle was blocked by a retreating defender. However, the marker had been laid. Ten minutes later a speculative forward pass out of defence by Tom Baptie was collected by Ashley Searle who calmly slotted the ball past the advancing Gregory into the net for 2-1. Soon after, the same combination led to the third goal. Baptie ran out of defence with the ball and lofted it forward for Searle to chase. Searle lifted the ball over Gregory to complete his hat-trick. Wallingford had several chances to add to their tally but were thwarted by last ditch stalwart defending, but on 83 minutes they were awarded a penalty when Baptie was tripped in the box. Searle stepped up and drilled the ball low into the bottom left hand corner for 4-1. There was still time for a fifth in the last minute as substitute Liam Reynolds ran down the right wing before crossing low to Andy Allum near the penalty spot and Allum slipped the ball into the net to add the icing on to Searle’s four timer. For the second successive week Saxton Rovers produced an outstanding performance to belie their league position to progress to a Cup semi final, this time winning 6-3 at home to Wallingford Town in the North Berks Cup, including a hat-trick for Kyle Allsworth. It was Wallingford who started the brighter creating a half chance on five minutes when Andy Allum crossed from the right and Ashley Searle fired a first-time shot over the bar from the edge of the area. 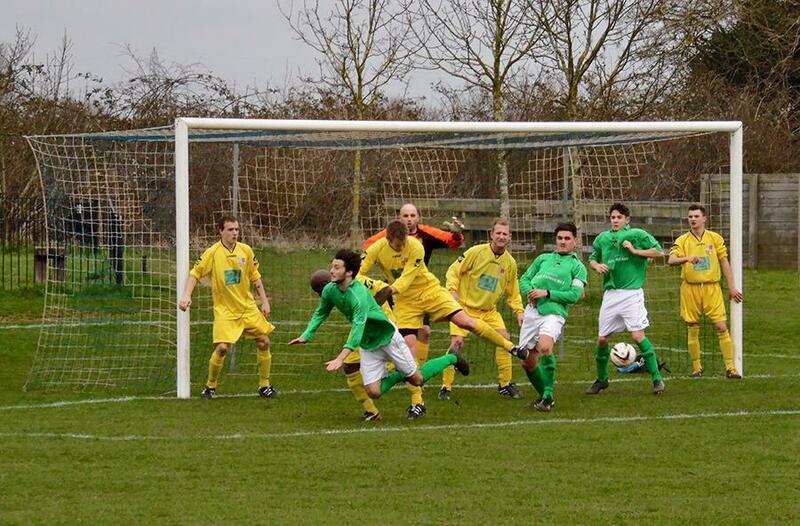 However, two quick goals in the space of four minutes gave Saxton Rovers a lead they never really looked like losing. Josh Haynes delivered a long ball out of defence into the Wallingford penalty area on the quarter hour mark, and a defender headed the ball out of his own keeper’s hands right into the path of Steve Pitson who headed the ball into the unguarded net. If that goal came out of defensive misfortune, the second minutes later came about courtesy of a great Saxton move. Wayne Waldron played Steve Pitson in on the right flank and he drilled a low cross all the way to Kyle Allsworth on the far side of the box. Allsworth stormed forward before drilling the ball past Jack Bullock to double his team’s lead. Wallingford continued to try to take the game to their opponents to reduce the deficit but to no avail. Ashley Searle shot low and just wide of the post on 28 minutes, Connor Mattimore smashed the ball across the face of goal a minute later, Andy Allum blasted high and wide soon after, and Elliott Westward fired the ball low and hard from 30 yards out only to see Matcusz Pocztarek in the Saxton goal dive well to his left to turn the ball around the post for a corner. Of course the inevitable happened and just a couple of minutes before half time Saxton made it three when Allsworth shot low from the left that Bullock could only palm into the path of Pitson who steered the ball home. It appeared to be ‘game-over’, but Wallingford came out in the second half with renewed vigour and scored twice in the space of ten minutes. First, Connor Mattimore crossed from the left to Ashley Searle completely unmarked in the box 12 yards from goal. Searle seemed to take an age, but eventually got his shot away to pull a goal back. Then, Elliott Westwood collected the ball as he ran diagonally into the right side of the box and drilled a half-volley on the run into the top of the Saxton goal for 3-2. Wallingford was right back in the game. However, the momentum was lost on 67 minutes when a long ball from Steve Bloomfield found Wayne Waldron on the edge of the area who managed to stretch out his foot ahead of the defender to knock the ball into the goal in-off the right hand upright. Soon after Saxton grabbed a fifth goal when Allsworth and a defender came together on the edge of the box connecting with the ball at the same time which somehow contrived to find its way into the net. Wallingford tried to stay in the game and on 84 minutes Ashley Searle was denied three times in the space of seconds by a Saxton clearance off the line. A minute later Steve Pitson was upended as he ran into the right side of the box and Allsworth drove the spot kick through the keeper’s hands for 6-2. Tom Davies did manage to sweep in a late consolation for Wallingford, but it was too little, too late, and Saxton progress to the semi-finals. Wallingford Town Reserves came from behind to secure their place in the North Berks League Cup Final to give them the chance of retaining the trophy they won last season. In an entertaining first half both sides created plenty of chances to score. Wallingford went first in the fourth minute when Wayne Mangan slipped the ball through the Berinsfield defence for Simon Bennett to latch on to running into the right side of the box. Bennett drilled a low ball across the six yard area to Mikey Bone at the far post, but he couldn’t get the ball under control and in the end tried a cheeky back-heel that went outside the left hand upright. Soon after, Berinsfield created their first chance when Lee Almond lofted a free kick down the left flank for Alex Kerry to chase. Kerry drilled a shot from a tight angle on the left, but Matty Leach in the Wallingford goal stood up well to block. Two minutes later, though, Jon Welch played the ball from the right wing inside to Ollie Smart on the edge of the area. Smart cleverly created space for himself with some neat footwork and fired the ball passed the keeper from 18 yards to open the scoring. Wallingford came back strongly to try to get the equaliser as soon as possible. Bennett slipped a ball through from his own half for Mark Garraway to run on to and he surged forward with the ball into the area shooting on the run from 15 yards out bringing out a brilliant stop from Tom Lovett. Mike Yardley blasted the rebound wide of the left post. On 20 minutes Mikey Bone cut inside to create space for a shot but his powerful drive was deflected at source into the arms of the keeper. Five minutes later the ball was played through to Bennett in the Berinsfield box. With good feet he avoided two challenges before laying the ball to Yardley to his left. Yardley then lifted the ball over the advancing Lovett to level the scores. Both sides had chances to take the lead before the half was over. Lovett did well again to block Mark Garraway’s shot at source, and Andie Samson fired a shot from 30 yards that Matty Leach did well to save low at his feet, but neither side were able to add to their total. The second half was insipid compared to the first with very little in the way of goalmouth action, and the winning goal, when it came, was more by accident than by design. Matty Leach had found he could drop kick out of his area right into the opposition’s box and just before the hour mark one such kick sailed the length of the pitch to bounce just inside the area. The high bounce caught Lovett off guard a little and he back pedalled towards his own goal. It looked as if Lovett was going to catch the ball, but he seemed to catch his foot in the goal net and instead of catching the ball for fear of being over the line he palmed it away, but only as far as Mikey Bone following in the long drop kick who pounced on the loose ball to score the winner. Berinsfield created a couple of half chances in the reaming 30 minutes or so with Leach using his knees on one occasion to block a Jon Welch shot, but Wallingford saw the game out to return to defend their trophy at Milton United on 11th April. Wallingford Town Reserves from Division Five will be able to try to defend their North Berks League Cup Trophy after coming from behind to win 2-1 against Fourth Division side Berinsfield Reserves. Ollie Smart had given Berinsfield the lead, but Mike Yardley and Mikey Bone won the tie for Wallingford. 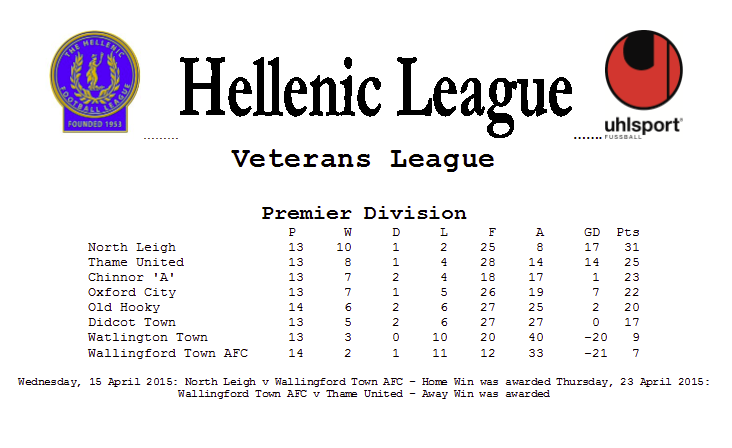 Wallingford Town remain in third despite being held to a goalless draw by bottom side Watlington Town who twice hit the woodwork. Wallingford Town survived an added time onslaught to make it through to the final of the North Berks Charity Shield. These two evenly matched sides created occasional chances during the first half hour or so without either team really threatening to take the lead. Louis Bloomfield nearly caught the Wallingford keeper napping with a quickly taken free-kick on two minutes, but Garry Clark managed to hold on to the ball. Saxton’s Tom Mullord nodded a tame header from a corner straight into Clark’s hands on 20 minutes, and Andy Allum came close for Wallingford three minutes later running in at the far post to head an Elliott Westwood ball against the left hand upright from close range. On 33 minutes the ball landed fortuitously at the feet of Riley Stone for Saxton, but he could only curl his 15 yard shot over the bar. Six minutes later, though, Saxton finally found the breakthrough. Kyle Allsworth delivered a high in-swinging corner that George Miles rose the highest to meet with his head and steer the ball into the net. The lead lasted just two minutes. Elliott Westwood collected the ball from a short corner on the left and curled a cross into the heart of the goal from where Ashley Searle rose to head the ball home from close range. And so the two sides went in at half time level, a true reflection on what had gone on in the opening 45 minutes. Wallingford came out slightly stronger in the second half. Connor Mattimore had a surging run down the left flank before crossing to the far post from where Searle headed just wide under pressure. On 53 minutes the ball fell to Sam Larking on the edge of the area and he fired a half-volley goalwards that deflected off the back of a defender trying to block and the ball looped over the keeper and into the net to give Wallingford the lead for the first time. Stuart Walker then headed a Connor Mattimore cross just wide on the hour mark, and following a period of little in the way of goalmouth action Kyle Allsworth made space for himself in the Wallingford area before seeing his low drilled effort well blocked by Clark. Wallingford extended their lead on 72 minutes after Searle jinked his way through midfield before laying the ball in the path of Larking who lifted the ball over the keeper on the run only to see it blocked by a defender. Larking pounced onto the loose ball and steered it home in off a defender for 3-1. Saxton started to then cause problems for the Wallingford defence as they searched for a way back into the game. A penalty appeal was waved away and as the clock showed 90 minutes it appeared all was lost. Then out of nowhere Steve Pitson fired a 20 yard effort into the left side of the net to halve the deficit and make for a nervy final few moments for Wallingford. Saxton came close to equalising, most notably when Clark misjudged a floated cross and Liam Smith headed the ball goalwards only to see a cool Bryn Ingram head the ball off the line. Wallingford held on and will face Faringdon Town in the final on 25th April. League leaders and defending champions Kintbury won 2-1 at home to Wallingford Town with Charlie Allsop and Shaun Thorp scoring their goals. Ashley Searle replied for Wallingford. Division Five Wallingford Town Reserves repeated their North Berks League Cup Final triumph of 12 months ago against the same opponents Faringdon Town ‘A’ from Division Four, this time by two goals to nil. It was Faringdon who created the first opportunity in a match with limited chances. Troy Redman played Sam Long in through the middle on four minutes and the forward slotted the ball beyond the advancing Matt Leach in the Wallingford goal, but Simon Cowlard, playing his last game for the club, scampered back to clear the ball off the line. On the half hour mark Paul Smith hit a half-volley from 18 yards that Leach caught with ease. Then at the other end Max Gallagher headed over the Faringdon bar. On the very next attack Mikey Bone was played through via a ball over the top and lifted the ball over Ian Oglesby to score the opening goal. Wallingford created just one more chance before the half was out when Liam Reynolds collected the ball on the left, cut inside, but fired over the bar from 20 yards out. Just after the re-start Tom Davies also volleyed just over the Faringdon crossbar. Just shy of the hour mark Camden Laver played his Wallingford team-mate Mikey Bone into the box, but Jacko Puzey did well to get in a latch ditch tackle. Within a minute though, the Wallingford captain, Dan Marks, collected the ball on the right and drove into the box before drilling a low ball goalwards which Oglesby could only palm into the net to double the Wallingford lead. There was little else regarding goalmouth action for the rest of the match and Wallingford saw out the tie to lift the trophy once again. Wallingford Town Res retained the League Cup with a 2-0 win over Faringdon Town A at Milton United. Division 4’s Faringdon, beaten finalists for the second year running, created most of the early chances, with Sam Long being denied by an excellent goalline clearance from Simon Cowlard. But they paid the price for their missed chances when Mikey Bone lobbed goalkeeper Ian Oglesby to put Wallingford in front. Dan Marks sealed it for the Division 5 side after the break with a low drive into the bottom corner, handing Wallingford their second successive League Cup success. 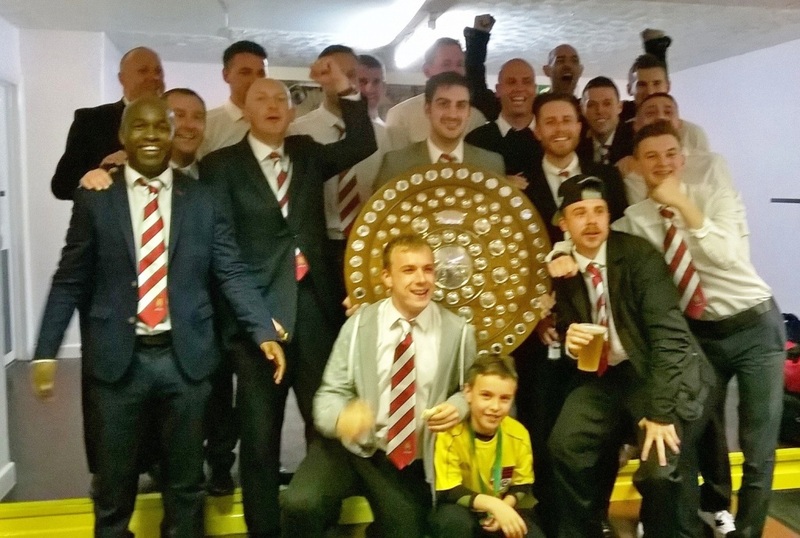 WALLINGFORD Town clinched the North Berks League’s Charity Shield for the first time since 1929 with a narrow 2-0 victory over Faringdon Town, writes PHIL ANNETS. The deadlock at Abingdon Town was broken six minutes from time when Tom Baptie bundled Connor Mattimore’s corner over the line. And they made sure of victory at the death when Sam Larking slotted home. The Heavens opened an hour before kick-off and the rain was relentless throughout the whole of this Charity Shield final which probably contributed to the match failing to live up to the spectacle one might hope for in a cup final. In truth Wallingford appeared to master the conditions better than their opponents and for large parts of the match controlled the game, but without making much in the way of serious inroads into the Faringdon penalty area. Their first opportunity came about on six minutes from a Sam Larking free-kick that Stuart Walker met with a looped header that was easy to claim for Ryan Curtis in the Faringdon goal. Curtis was troubled more significantly on 14 minutes, but produced a fine double save to first block Stuart Walker’s 12 yard volley and then somehow get up to turn behind Andy Allum’s goal-bound headed follow-up. Faringdon threatened little during the first half with just a couple of half-chances around the half hour mark, first when Paul Whitewood headed across the face of goal from a corner, and then when Robbie Harrington hit a 25 yard free-kick just wide of the left hand post. Wallingford were unfortunate not to take the lead five minutes before half-time. Sam Larking saw his drilled shot well saved by Curtis and Connor Mattimore saw his follow-up effort cleared off the line by a defender. The second half continued in the same vein as the first, with Wallingford on top, but with few clear cut chances and being unable to create the breakthrough. Mattimore saw another effort blocked by a defender on 56 minutes, Ryan Bradbury hit a 25 yard shot for Faringdon straight at Garry Clark in the Wallingford goal, and an error by Curtis gifted the ball to Ashley Searle close to goal but he couldn’t force the ball over the line thanks once again to a resolute Faringdon defender. The game seemed to be sleepwalking to extra time, but two goals in the last six minutes won the match for Wallingford. First, Mattimore delivered an in-swinging corner that Curtis again failed to deal with, but this time there was no defender to prevent Tom Baptie steering the loose ball over the line. Then, right at the last, Ashley Searle broke free on the left and just beat Curtis to the ball to play it across the goal to Sam Larking who outpaced the defender to slot the ball into an empty net. 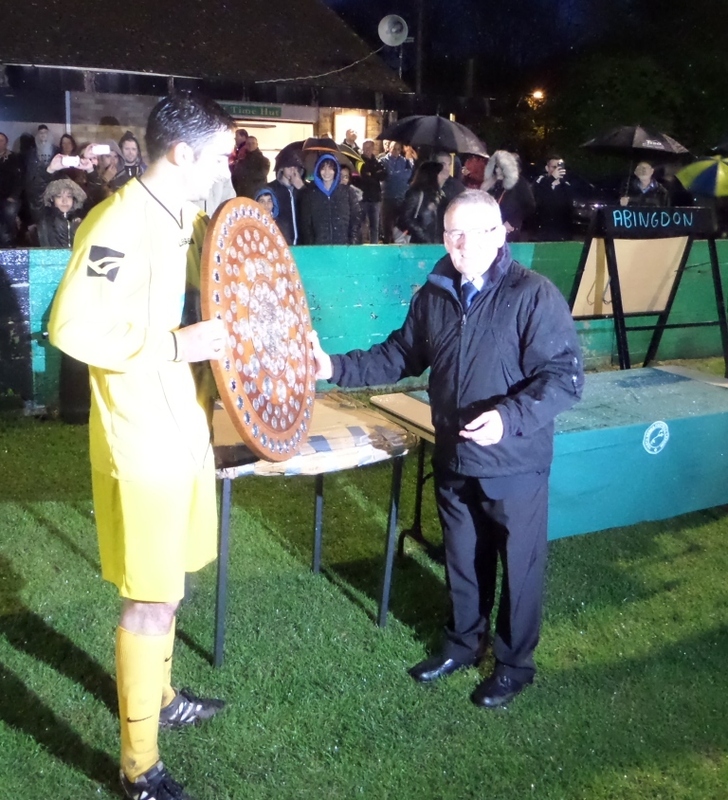 Wallingford won the Shield and BBC Radio Oxford’s Hedley Feast presented it to their captain, Stuart Walker, ahead of the rain-drenched celebrations. With nothing riding on this match it was played in the style of an end of season friendly between the Charity Shield winners Wallingford Town and the recently crowned Division One champions Berinsfield. Berinsfield actually played players out of their normal positions with traditional playmaker Mark Ingram turning out in goal and the front two of Luke Saunders and Luke Hammond more used to stopping attackers than being attackers. Not that that made them less determined to win, no-one likes to lose after all, but it did mean the match wasn’t as competitive an affair as it could have been. Luke Hammond had the first meaningful attempt on goal on 13 minutes when he curled a right footed shot from the edge of the area that Garry Clark plucked out of the air. Clark lobbed the ball out to Andy Allum who ran into the opponent’s half before laying it off for Ashley Searle running towards the right side of the box. Searle hit a shot on the run that Ingram did well to push upwards, but only onto the underside of the bar, and the referee adjudged the ball bounced over the line for 1-0 to Wallingford. And so it remained until the end of the first half. Wallingford came out with more purpose in the second period and doubled their lead after capitalising on a way too short back-pass by a Berinsfield defender. Connor Mattimore stole in to mick the ball and laid it off centrally to Ashley Searle who slotted it into the empty net. Just past the hour mark it was three when Nathan Larking delivered a long throw into the six yard area and Luke Hammond sliced the ball into his own net. Harris then took over from Ingram in goal, and soon pulled off a fine double save. He went one better on 86 minutes saving three shots in quick succession only for the ball to fall to Andy Allum who scored from close range to make it 4-0. There was still time for Harris to produce a last minute stunning save from a drilled Ashley Searle effort, which prevented his hat-trick and Wallingford getting their fifth. 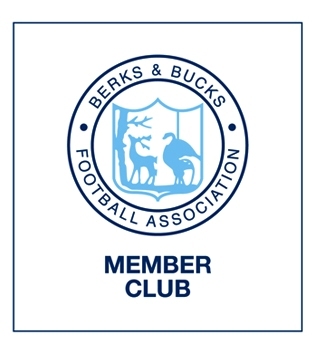 It’ll be a much different Berinsfield formation next week when they face Saxton Rovers in the North Berks Cup final at Abingdon United, 9th May, Kick Off 7.0pm. Well done on a promising start to the season. I have just updated the appearances and goals spreadsheet and see that Mr Searle has been nothing short of prolific so far – eight in five games, plus one at the end of last season. Stuart Beavon, now of Burton Albion and previously of Preston North End and Wycombe Wanderers, scored in seven consecutive games during October 2003. Ian Concannon (Didcot Town’s record goalscorer following 82 for us) and Carl Henry (116 goals in 75 games for us) share the record, scoring in eight consecutive matches in 2000 and 1998 respectively. Scoring on Saturday will put Ashley in exalted company! Ashley has now scored 47 goals in 58 appearances (49 starts plus 9 sub), just a hat-trick away from being the first player to score 50 goals for WTAFC/AFCW since Bradley Ward in 2004. Connor made his 89th appearance last Saturday, so will have a centenary approaching around Christmas time, barring injury and suspension. Mikey Fellows is way ahead of him on 221 appearances (4th on the all-time list), though I think he is now on tour with the RAF again.